This photo shows blue light over New York, as seen from Manhattan Borough of New York on Thursday, Dec. 27, 2018. 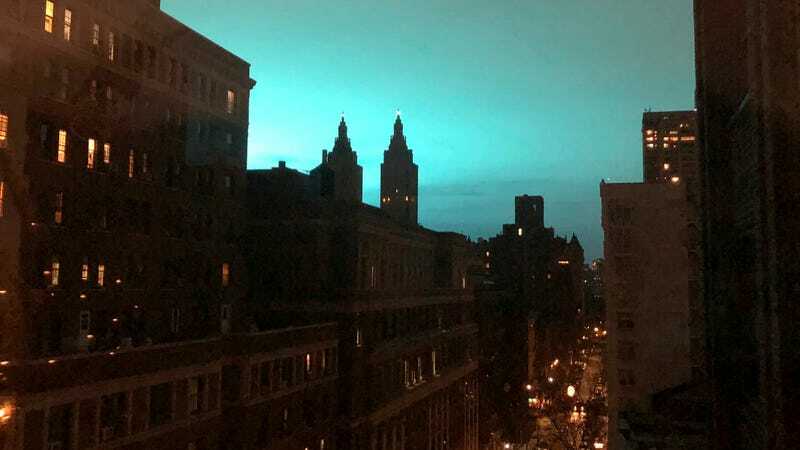 New York’s night sky was bathed in a green-blue light Thursday night, with police saying that an investigation into the cause is currently underway but that they believe it may have resulted from a transformer explosion at a power plant in the Astoria neighborhood in Queens. “The lights you have seen throughout the city appear to have been from a transformer explosion at a Con Ed facility in Queens,” the New York Police Department tweeted Thursday evening, adding that the fire was “under control.” Speaking with Gizmodo by phone, an NYPD spokesperson said there were no reported injuries or deaths in the incident. According to separate reports on social media, there was also a power outage at LaGuardia Airport, which is also situated in Queens. The airport tweeted that it was experiencing delays and that some flights were not departing as a result of the incident. “There was a brief electrical fire at our substation in Astoria which involved some electrical transformers and caused a transmission dip in the area,” the company said in a subsequent tweet, adding that it was investigating the cause.